Cadbury appears to be readymade for social marketing as it is a historic brand with products that people love. However it hasn’t simply rested on its laurels and expected the ‘likes’ to come rolling in. In the past year we’ve reported on Cadbury’s use of Facebook and Google+ for product launches, as well as its shift away from traditional media thanks to its success in social media. Therefore I thought it would be interesting take a closer look at how the brand uses Facebook, Twitter, Pinterest and Google+. This post is the latest in a series that has already examined the social strategies of several other major consumer brands, including ASOS, Tesco, McDonald’s and Red Bull. It’s no surprise to find out that Cadbury has established separate Facebook pages for each of its most popular products, including Dairy Milk, Wispa, Crème Egg, Bourneville and Hot Chocolate. Each one publishes its own content and competitions making it difficult to condense it all into a single blog post, so I’ll just focus on the key highlights. The first thing to note is that all the pages are updated on a daily basis with brand-related content, ranging from straightforward product promotions to recipe ideas. In general each post attracts thousands of likes and tens of comments, which the social team does a good job of responding to. Cadbury clearly sees value in maintaining an active Facebook presence and interacting with customers, probably because it has already achieved a great deal of success in nurturing its fans as brand advocates. This is a departure from the more casual approach adopted by Starbucks and McDonald’s, which make very little effort to maintain their social communities but still achieve massive levels of engagement on their Facebook walls. Looking specifically at the Dairy Milk page, most of the content is currently about promoting the Joyville brand with a strong focus on its competition to find a ‘Joyville Taster’. The winner receives a trip to the Cadbury factory, a year’s supply of Dairy Milk and the chance to be the first to taste new products. To be in with a chance of winning you have to come up with a word to describe Dairy Milk chocolate then enter it either on a dedicated minisite or within a Facebook app. It’s a really smart competition as the prize is positioned as a ‘sweet benefits package’ that comes alongside the fictional job. It’s a great way of rewarding fans with a prize that can’t really be won anywhere else. The Wispa page is also running a promotional campaign to celebrate reaching two million ‘likes’. The social team has researched its fans and has begun publishing random stats about them. Again, it’s a clever way of celebrating the community and the posts make a nice change from the usual product promos. The current Wispa campaigns follows a brilliant campaign that the Dairy Milk team ran last year to celebrate reaching one million ‘likes’. Cadbury realised that despite having so many fans, only 16% of them ever saw content that the brand posted on Facebook. The challenge was to increase the engagement among its fans, as well as reaching friends of fans and the wider Facebook community. To test what content users would engage with, Cadbury decided to build a giant Facebook ‘like’ thumb out of pieces of Dairy Milk. It used teaser ads in the build up to the event, and then live streamed in a studio decorated with user-generated content and photos. The team also responded to user requests and comments in the video. As a result, Cadbury gained 40,000 Facebook fans and more than 350,000 people were actively involved in the campaign. Some fans even left the live feed running for hours on end. Perhaps the most important result was that more than 33% of fans engaged with the campaign and it proved that the brand could achieve impressive results through social marketing, which helped underpin the new Joyville marketing initiatives. As with Facebook, Cadbury has established separate Twitter feeds for it different products, but unfortunately it hasn’t achieved the same amount of success. The main corporate account has more than 130,000 followers, far more than any of the product-specific feeds, and tweets upwards of 20 times per day. However most of tweets are either repurposed from Facebook or are retweets of other users that have mentioned the brand. The social team do occasionally respond to @mentions, but these appear to make up a small proportion of the activity. The Dairy Milk (31,000 followers) and Wispa (6,000 followers) feeds are much the same, with repurposed content and retweets making up a majority of the activity. Personally I’m surprised that so little original content is published through Twitter, and that Cadbury responds to relatively few @mentions. It is probably a decision dictated by resource to an extent, as it’s obviously easier to adopt a centralised approach to social and limit the amount of responses. However ASOS and Tesco have taken the decision to respond to as many @mentions as possible, and personally I feel it is a great way of engaging with customers and building brand loyalty. Furthermore, unlike a number of other consumer brands that I’ve looked at, Cadbury doesn’t attempt to provide customer service on Twitter. Instead it includes a link to the customer service contact information in its bio. That said, Cadbury did make an interesting case study for the success of Twitter advertising. It revealed that a campaign to promote the new Wispa Gold using Promoted Trends increased ‘positive’ brand mentions on the social network by 1,800%. Furthermore, the ‘Retweet for Sweets’ challenge associated with this saw engagement levels of 25%. Cadbury UK has been running a Pinterest board for more than a year now, but its level of commitment has been somewhat lacking. It has created just five boards and pinned a grand total of 116 images. Thankfully Cadbury hasn’t fallen into the usual trap of only pinning its own content, however its difficult to see what the social team is hoping to achieve by maintaining this account. Cadbury has just 622 followers and there doesn’t seem to be any real strategy behind it. The boards are generally quite uninspiring – one of them is just a collection of uniform images of gluten free products – and the activity is extremely limited. The latest board is definitely the most attractive and includes a range of images showing recipe ideas that use Cadbury products. But overall the account is largely inactive and I can’t imagine it yields any positive results for the brand. While researching these posts I noticed that the general trend among consumer brands is to establish a Google+ account and then totally ignore it. There are a few notable exceptions, such as ASOS and Red Bull, but they are few and far between. However I can also add Cadbury to the list of brands that have embraced G+. It posts several updates a day, much of which is repurposed from other platforms though it seems some of the content is unique to this platform. The chocolate brand was an early adopter of G+ and last year social manager Jerry Daykin was kind enough to share his five top tips for using the platform. Google has also flagged up the brand a case study for how to make use of Google Hangouts. Cadbury has hosted several hangouts in the past 12 months, including one to celebrate reaching 500,000 followers and another to let its community ask questions to Olympic swimmer Rebecca Adlington. At the minute much of the content is focused around its recipe for Crème Egg brownies, which also links into its Cakes and Baking Community. The group has 26,000 members who share and discuss recipe ideas, which is a great way of getting people talking about the brand and its various products. For Game of Thrones fans Iceland provided the beautiful background for one of the most unique conference experiences ever. Today, many of the leading experts on search and social gather to share content and insight at the Reykjavik Internet Marketing Conference (RIMC). 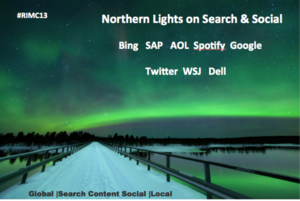 Thought leaders and industry experts from across the Globe talk us through “Seven search Kingdoms” that help make up the online marketing space in 2013: Search, SEO, Social, Content, Mobile, Local and Video. The conference organized by Kristjan Mar Hauksson and Nordic Emarketing is a two-day boot camp with great speakers and fantastic content focusing on search and social. Brands from across the globe gather to share insight and the epic list includes speakers from Bing, Google, Dell, Twitter, AOL, Spotify, SAP and iCrossing. Econsultancy’s very own Ashley Friedlein has spoken in the past at RIMC as it now marks its 10th anniversary! I asked the experts on their top tips for managing search and social in 2013…. It’s “divide and conquer” when it comes to email lists. Your analytics team is charged with putting your customers into their respective buckets. Then it’s the job of the marketing and creative teams to come up with relevant messaging targeted to each segment. Marketers are familiar with the traditional types of segmentation, such as gender, age, location and engagement. These types of segmentation pay (literally), however, it can be even more rewarding to dig a little deeper into your list and find the correct segmentation for the job. Following are five less-common methods of segmenting your list. The topics include the mobile music industry, HTML5, Samsung’s apparent dominance over Apple, mobile app behaviour and real-time bidding.